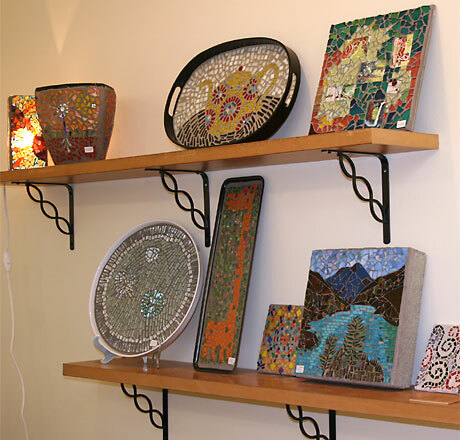 These mosaic projects are complete packages, perfect for the beginner or someone who just wants to make one or two mosaics. You design your mosaic using our simple and satisfying technique and then we do the messier cementing and grouting. Mosaics can be started any time. Simply drop in and begin. Studio time to create the mosaic – take as much time as you need with your project. You come to work on it anytime we are open. If not completed in one setting we will store it for you. When you are done, leave your mosaic with us to cement and grout. We are happy to work with you on custom projects. We can help you move your ideas forward and will give you estimates of what it might cost. Please call or come in with any questions. Prices vary greatly depending on how large a surface you are working on and who is doing the cementing and grouting process. Please see our membership page to get more information on how becoming a member can give you significant savings on anything you mosaic.